Iranian Chief of Staff Major-Gen. Hassan Firouzabadi said Saturday that despite some reservations, he saw 16 major advantages to the Iran deal. He didn’t mention any specific disadvantages. He said that Iran’s right to enrichment has been recognized. He noted that the tone of the UNSC resolution issued concurrently with the deal had also softened toward Iran, and the world body was now requesting compliance with regard, e.g., to missiles, whereas before it commanded imperiously. Other advantages in his view include the document’s call for end of sanctions if Iran complies with its conditions. Likewise, the end of sanctions is envisaged on a specific timetable. Many of his points have to do with Iran’s relationship with the UN Security Council. For instance, under previous sanctions resolutions, Iran was not given a right to be in the room for their formulation. But with regard to this resolution, Iran can be present for further deliberations regarding it. In other words, Iran was formerly treated as the object of the UNSC’s wrath, whereas now it is being treated as a negotiating partner in good standing. 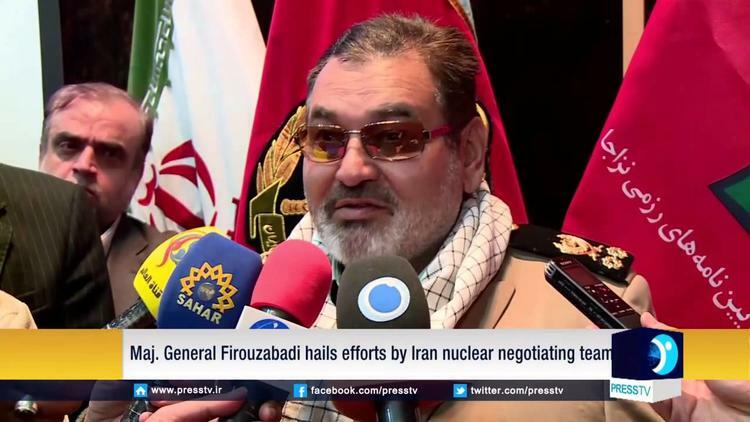 Maj.-Gen. Firouzabadi’s emphasis on Iran’s improved position, under the nuclear deal, vis-a-vis the UN Security Council, allows him to praise it without even mentioning the United States (except to the extent that he implies that the new resolution will constrain all UNSC members to respect it). Firouzabadi was appointed by, and is close to Iran’s clerical leader, Ayatollah Ali Khamenei, and for him to speak openly in favor of the deal is likely a sign that Khamenei is supporting it.